The home of fitness in Kerry. Riocht Health & Leisure club members enjoy a welcoming environment where everyone at every level of fitness can feel comfortable. Our main fitness suite offers top of the range exercise machines, free weight and cardiovascular equipment. An Riocht consists of an athletics club and a health club, each of which cater for a wide range of fitness, health and performance needs. Contact us if you would like to learn more about any of our facilities. Our club boasts the very best of fitness facilities where all levels of fitness are catered for, from the complete beginner to the high performance athlete. Team Riocht thrive on the track, field & road with many successful teams & athletes. It is a team to be part of at county, national & international level. We Are An Riocht Athletic Club. Based in Castleisland, Co. Kerry, we are a successful senior and juvenile athletic club with athletes competing at all levels from domestic to international. 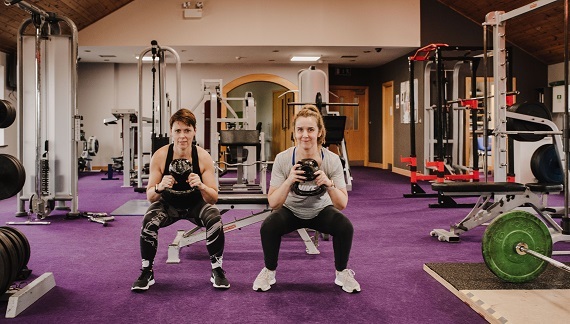 Our exceptional health club facilities are used by everyone from beginners to exercise to high performance athletes with top class coaches to guide you on your fitness journey. Be part of the energising atmosphere by exercising with us here at An Riocht. 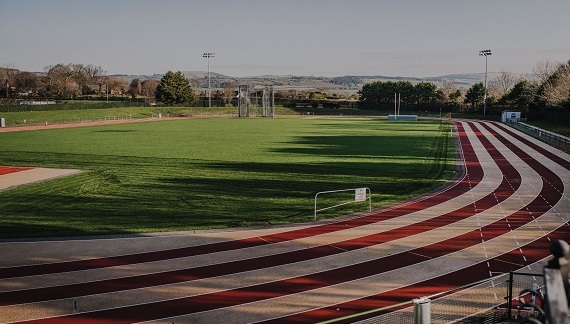 A 400m tartan IAAF standard athletics track which is used for training and for competitive track and field and is the only facility of it's type in Kerry. There are always exciting fixtures and developments at An Riocht. Make sure you stay up to date on all our latest news and information. 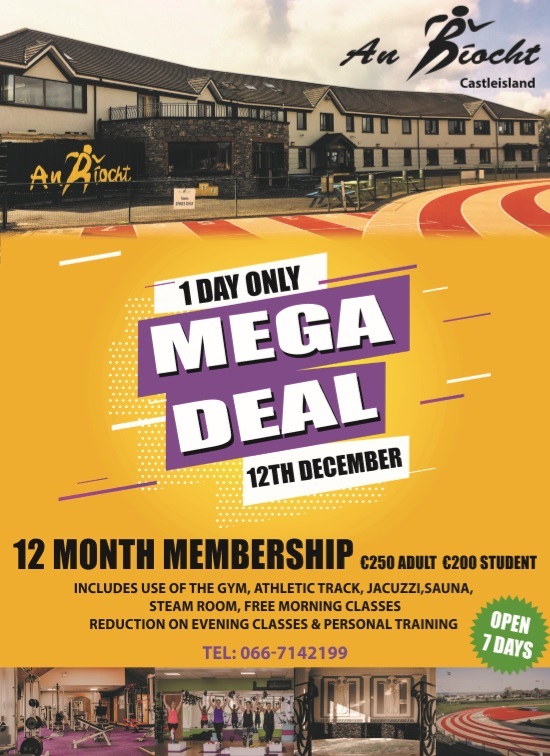 We have a huge one day sale available on the 12th December. All you have to do is hit the button to download the app. There is also an instructional video below if you are unsure. 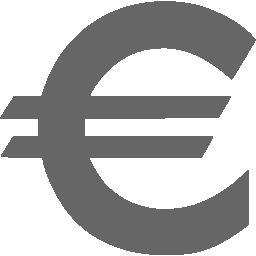 We are also taking payment over the phone too simply by calling 066-7142199. If you have any queries please do not hesitate to contact us. Riocht Athletic Club was formed in 1975 to promote athletics as a means of recreation for the people of Castleisland and its hinterland. The Crageens is 150 meters from Castleisland's main street. Castleisland is a small country town with a population of just 2,281 people. The site consisted of 10.5 acres of prime land along the banks of the river Maine. The development of the site, including as it does a municipal park, would enhance the area and give much needed recreational opportunities to young and old. The site was previously used solely for agricultural purposes and had no development whatsoever on it. At this time the club had nowhere near enough money to transform this site into what they wanted it to be. For the moment club members were content in surfacing the access roads of the site, levelling the site and landscaping the surrounds leaving a running track of a 300m perimeter. From 1990 to 1998 while many members of the club were raising money through monthly lotteries, golf classics and so on, the site was actively being used for both cross country and track and field athletics training and often due to a lack of athletic facilities in the county it was the location for county track and field championships. 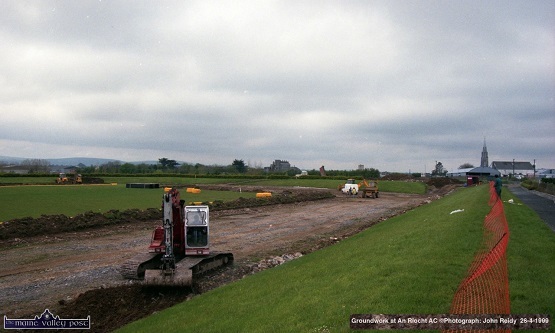 In 1998 work began on the athletics track. 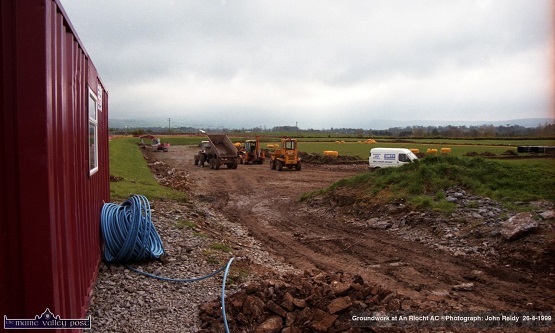 J Thornton's & Sons who specialise in sporting surfaces came with a crew from England were given the contract and the construction of the athletics track took only a few weeks. The total cost was 1,000,000 and this included the construction of the 400 meters, 8-lane tartan running track, throwing section with cage and 2 long jumping pits, high jump and pole vault area and high quality football pitch. This development was a major milestone in athletics history in the country. The Riocht athletics track was one of only two privately owned athletics tracks in the country at the time along with Tullamore Harriers of Co. Offaly and it was a major achievement by the dedicated committee. 1956 Olympic gold medallist Ronnie Delaney officially opened the track in 2000. After that Kerry athletics saw a major improvement in standards. The county athletics squad which in the year 1999 only won one national junior medal in 2001 won 7 and by the year 2003 Kerry athletics were winning the vast majority of their national and Munster medals in the field events, testament to the quality of the developments at Crageens. 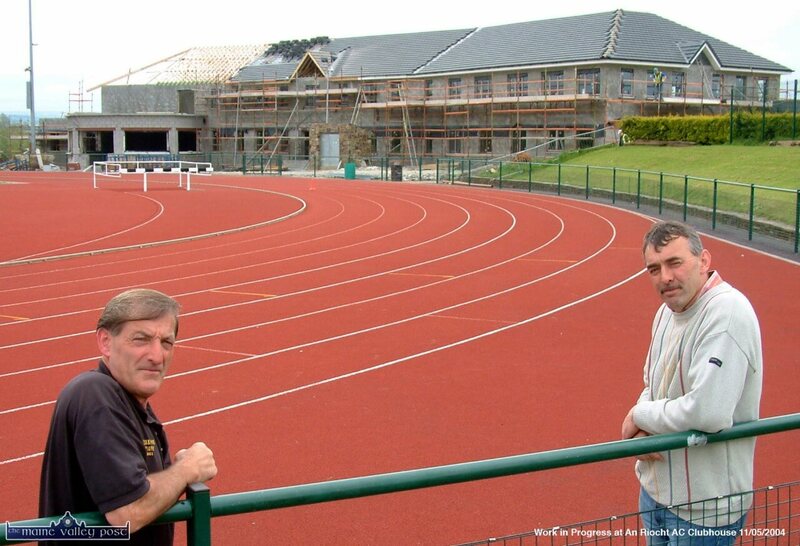 The track itself was being used daily by a wide range of sports people and sports clubs. 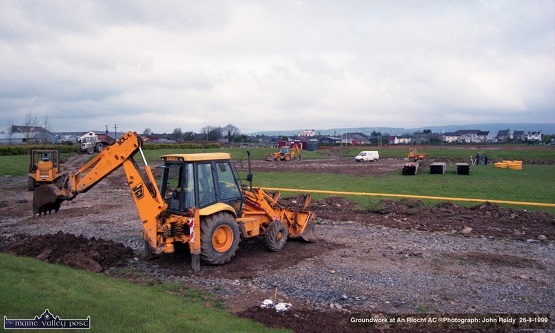 Due to the quality of the all weather pitch in the infield and the stadium quality floodlights many sports clubs other than the athletic club itself-gaa, soccer, rugby were making regular use of the track and pitch. 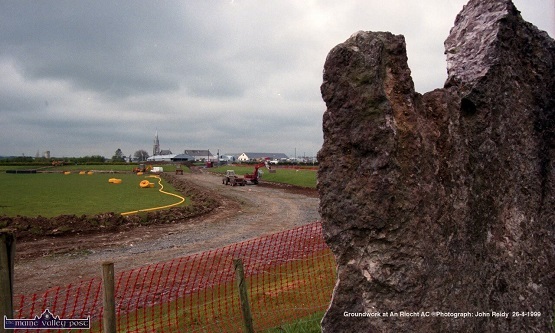 The week after the official opening in 2000, An Riocht was host to the Munster Juvenile U.9 to U.13 championships, which saw 1,500 competitors in the track and field events and a spectator number of 3,000. The track now hosts all county track and field events as well as 3-4 Munster championships a year and has hosted the AAI (Athletics Association of Ireland) games. National events coming to Castleisland were somewhat limited and this was mainly due to the lack of changing facilities. As it was changing facilities were in the form of a portacabin on the days of big events only. If the number of daily users and high profile events were to increase indoor facilities would have to be constructed. The committee again put together a funding strategy and began planning their building. 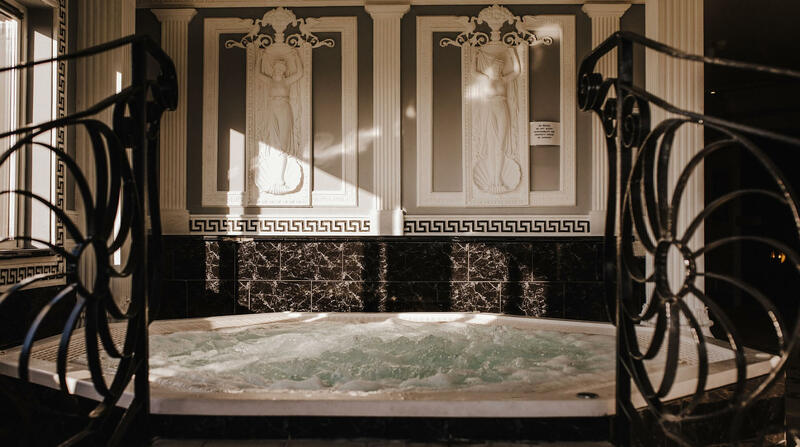 The plan was to construct a 13,000 square foot two storey building, which would incorporate a small sports hall, a 1,400 square foot fully, equipped gymnasium, relaxation suite comprising of sauna, steam room and Jacuzzi. The building would cost in the region of 1.5million and would have to be supported through the government in some form of a grant. The committee then made an application to the government's sports capital grant. The application was a substantial one, which contained letters of support from local clubs that were using the facility and from many athletics coaches and officials from grassroots to national level. All these people argued that a clubhouse containing indoor changing facilities and toilets would be of enormous benefit to the athletics track. The club itself outlined in the application how these clubrooms incorporating the different facilities would be excellent for the whole region and how it would, with indoor facilities, be a lure for all sorts of people from those who want simply to lose weight to the elite eventually bringing about a healthier lifestyle for the people of the town and of surrounding areas. In August 2004 the club received 750,000 from the Department of Arts, Sports and Tourism. This was more than anyone on the committee had expected and, would, with help of a fundraising drive of their own allow the club to go ahead with their ambitious plans. The fundraising plan was to hold a major draw at the end of 2005 with a top prize of 50,000 and 6 prizes of 1,000 with the tickets being 100 each. The draw would need everyone involved in the club to step in so that groups of 2 or 3 could go door to door selling tickets in different areas. The draw was very successful with 1,800 tickets being sold leaving the club with a profit of 124,000. In early 2004 work began in the clubhouse, which was located at the south western side of the existing track. After several open days and different types of advertising the clubhouse was open to the public in February 2005. JOIN US AT AN RIOCHT. The Riocht grounds are located at Crageens Castleisland and boasts an international standard 400 Meter Tartan Athletics Track with in field Soccer Pitch and a new State of the Art Gym with Spa Facilities. Riocht Health & Leisure club members enjoy a welcoming environment where everyone at every level of fitness can feel comfortable. Our main fitness suite offers top of the range exercise machines, free weight and cardiovascular equipment. © Copyright An Riocht. All rights reserved.